People in the gun culture/gun community/whatever you want to call it can get obsessive with ballistic data, and one of the attributes that consumes many people is that of muzzle velocity. The speed at which a bullet leaves a barrel does matter, after all...to a degree. It isn't everything, however, but there is a reason why many people believe it's one of the key attributes for ammunition, whether it's self-defense ammunition or match/target ammunition or hunting ammunition. That said, let's get into why velocity matters. Generally speaking, a higher muzzle velocity correlates to a flatter trajectory, meaning there is less bullet drop over a given distance when the velocity of a projectile is increased. On paper, anyway. There's a lot more that goes into it. For instance, a .30 caliber projectile, say a 165-grain bullet, will drop more over a distance of, say, 300 yards if loaded for .30-06 as opposed to the same projectile when loaded in .300 Winchester Magnum. The latter cartridge holds more gunpowder and is built to handle greater pressure. As a result, it sends the same bullet out at a faster velocity. Let's compare a few figures. If we look at some reloading data from, say, Nosler, the powder charge in grains of various powders and muzzle velocity for a particular bullet. If one selects, say, IMR4350 powder, the median charge for '06 is 54.5 grains of powder which yields velocity of 2636 feet per second. For .300 Win Mag, it's 68 grains of powder and 3060 fps. Those are just examples; many, many loads for both are out there. However, let's look at factory ammunition. If you compare, say, Federal Premium ammunition in those calibers with that specific projectile - 180-gr Nosler Partition - Federal's ballistics report the 180-gr. '06 has a muzzle velocity of 2700 fps and will drop 14.5 inches at 300 yards with a 100 yard zero or 8.5 inches with a 200-yard zero. By contrast, their 180-gr. Partition load for .300 Win Mag has a muzzle velocity of 2960 and drops 12.3 inches at 300 yards with a 100-yard zero or 7.4 inches with a 200-yard zero. Granted, there's a lot more that goes into bullet trajectory. Barrel twist rate will affect how fast a bullet spins, which does matter. Bullet design matters as well, and a great deal too, since trajectory is also affected by the drag of the air on the bullet in flight. Wind speed and humidity will also affect bullet flight. But with that said, bullet trajectory is flatter - on paper - with greater muzzle velocity, meaning that it's easier for a person to shoot longer distances without having to compensate too much for bullet drop. There's a reason why +P ammo got very popular. That's because the increase in muzzle velocity aided in the expansion of hollow point ammunition. You see, there wasn't much choice in self-defense ammunition for a long time. Jacketed hollow points for handguns (JHP rounds for rifles existed before 1900; they were called "dum-dums") weren't really available on any scale until the 1970s (Norma being an early producer) and then started to really ramp up in the 1980s with Federal Hydra-Shok and other examples. Prior to that, semi-wadcutters were the most popular type of defensive ammunition. Lead semi-wadcutter hollow points in particular were pretty much the standard. Now, one thing that was well-known was that the 158- grain .38 Special LSWCHP rounds worked for the most part, though weren't 100 percent reliable. They also DEFINITELY worked better out of barrel lengths of 4 inches or longer. What was also noticed was that the same bullet was far more reliable from a .357 Magnum that had a 4-inch or longer barrel. The difference? .357 Magnum has a few extra grains of powder and somewhere between 300 fps to 500 fps more than .38 Special. Likewise, to get the most out of the 115-grain 9mm JHP, it was often necessary to use +P or +P+ to get reliable expansion, at least until recent years when the standard pressure loads started to get a whole lot better. The reason, you see, is that as velocity increases, so does the resistance of tissue when the bullet arrives. Since bullet design took some time to get reliable expansion at lower velocities (this is why it was necessary for Speer to cook up the New York load) with smaller bullets, more speed was needed. Granted, bullet design plays a part too, and actually a big one. So does surface area and weight of the projectile. Part of the reason why .45 ACP, for instance, expands so dramatically is that it's a big, heavy bullet with more surface area for hydraulic pressure to work on. So, is it important that a bullet travel fast? Certainly...but it matters less if you obtain quality ammunition. 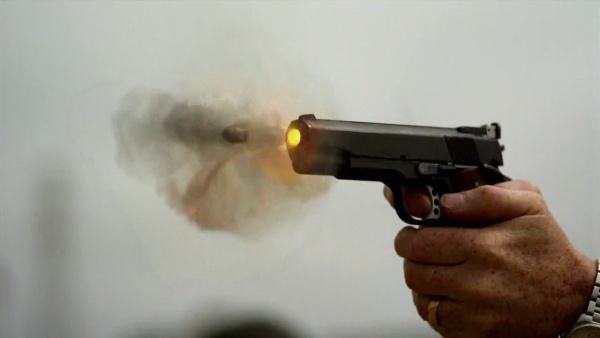 One area where muzzle velocity plays less of a role is in recoil. It actually doesn't do as much as you'd think. As we know, recoil comes in two forms: physical recoil and felt recoil. The former, of course, is an amount of force generated by the gunshot itself. The latter is how that force is experienced by the person shooting the gun. Velocity matters in terms of physical recoil; F=MA, after all...but it's less of a factor than you'd think. In other words, velocity does affect recoil but an increase in velocity has less of an effect than an increase in mass does. 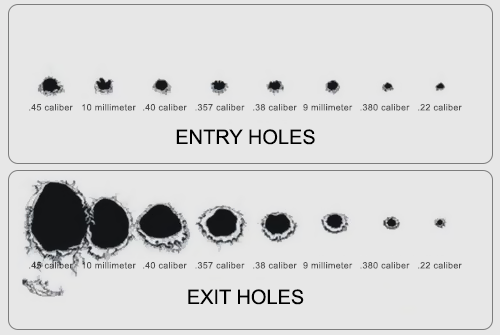 Bullet mass is one of the biggest predictors of felt recoil, along with the weight of the gun you're shooting. More gun = more mass = less recoil force being transmitted into the shooter. For instance, an 8-pound rifle chambered in .223 (a really heavy AR) generates about 3 ft-lbs of recoil force shooting a 55-gr bullet at 3200 fps. By contrast, an 8-pound .30-06 shooting a 165-gr bullet at 2900 fps generates about 20 ft-lbs of recoil. Yes, this is why the bolt gun guys make fun of you. "Nice AR," they say, "do they make them for guys?" Don't listen to it. Remind them that a box of .223 goes for only $10 and watch them get sad all of a sudden. Fit matters too, as that has to do with how well a long gun fits to the shoulder. A good fit means you'll feel it less. You can also add a Decelerator pad which shaves a bit off felt recoil as well. For handguns, fitment is also important. More ergonomic grips can reduce felt recoil considerably. Another big factor in felt recoil is bore axis. 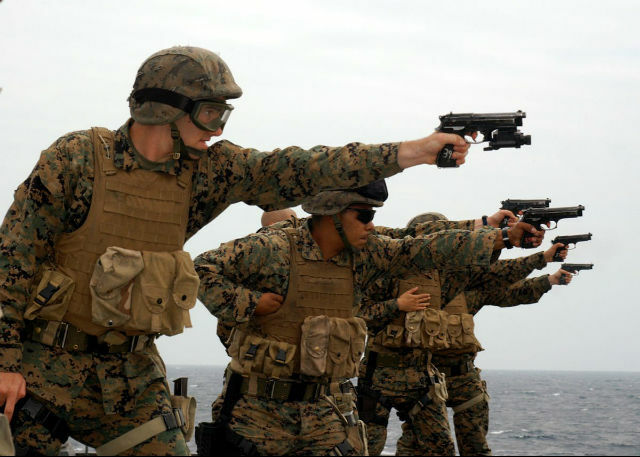 You see, when a handgun discharges, the gun is pushed backward. Since a handgun is held by the hand, the pistol causes the wrist and/or elbow to rotate. The higher the bore axis, the more the wrists and elbows are made to rotate. Of course, bullet mass plays a part in this as well, but you'll notice that shooting, say, a Sig Sauer or H&K gives you a bit more muzzle rise than a CZ. This is due to the bore axis. Naturally, you'll also feel more muzzle rise out of a 1911 in .45 ACP than you would with a 1911 chambered in 9mm, which is a breeze to shoot. Thus, it can be said that bullet mass along with bore axis influence the physical force of the recoil along with the muzzle rise, which influence what you, the shooter, feels.